Layer Foam Features to Create Wild Masks! Create a Cat, Mouse, Dog, Lion, Elephant and More! 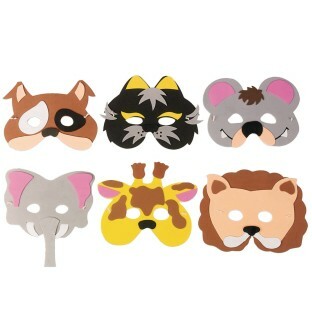 Includes 4 Masks of each design, Elastic and Instructions. Requires adhesive tape, sold separately. Should be assembled with glue sticks strong bond it takes ways too long for regular glue to dry. The children enjoyed selecting their mask.